Winner of the 2016 Best Restaurant Award for Best Roadfood! One of Connecticut's most well-known hot dog stands, Super Duper Weenie, started with a truck that owner Gary Zemola saw in a book of paintings by photorealist John Baeder. With Baeder's help, Gary located the owner and bought the truck in 1992, gutting the inside but preserving and restoring the hand painted exterior. 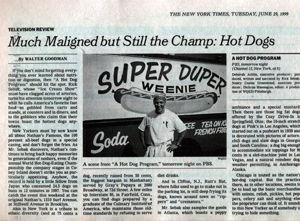 Super Duper Weenie started off as a hot dog truck on a traffic circle off I-95 back in 1976. A few years they moved to their current location just off the circle. Only problem there are what seems like 43 roads that, in true New England style, flow into the circle. Few things in life are worth negotiating a New England traffic circle. Super Duper Weenies is one of them. Recently we had a visit from a fellow brother in the brotherhood of the greasy spoon, Guy Fieri. After hearing about our own made condiments and freshness of our food, Guy had to come out to taste it for himself. He spent a whole day with us, watching how Gary prepared some of his famous concoctions. You can see the the day on "Diners, Drive-In's and Dives"... which airs on the Food Network. A prophet is never received by those living in his own town... So having the folks in your own backyard notice what your doing is an honor. 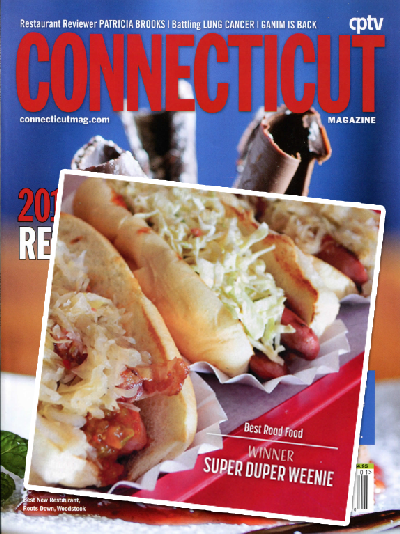 We were named the best hot dog of the Gold Coast of CT by Greenwich, New Canaan, Darien and Westport magazines... Click above to see what they said!